Ever wonder what it's like to live in a small village? Don't know about you, but I've always lived in the Suburbs. First in Chicago. Then in...Seattle, New Jersey, Miami, Chicago again, Ann Arbor Michigan, San Francisco, Los Angeles, Long Island, San Francisco again (Dublin California, actually)....then Ireland...Navan, Kentstown, Trim and Dunshaughlin, all in County Meath. And all of them (except Kentstown which could be best described as a wide spot in the road) were Suburbs. Well, there are no Suburbs in Eyeries. 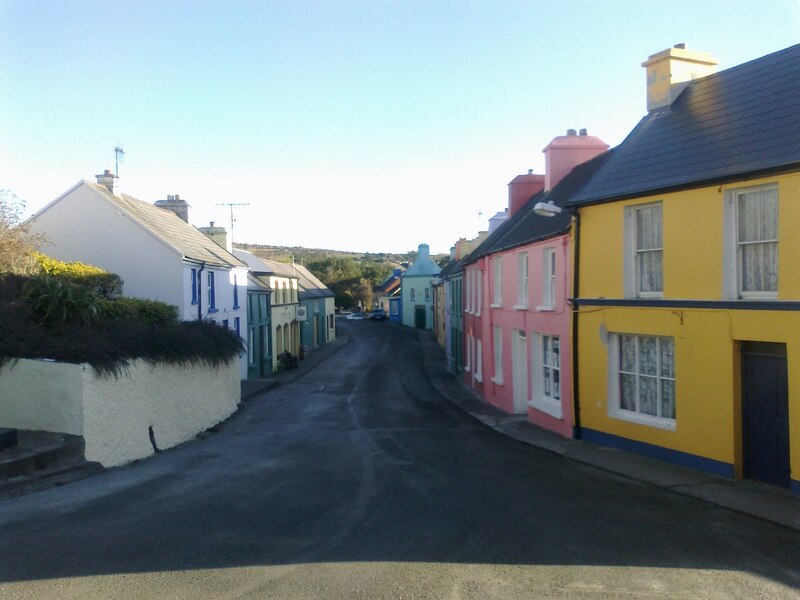 Located on the Beara Peninsula in the very southwest of County Cork (and the island of Ireland), and the next stop west being northeastern Canada, Eyeries is a village of only 65 (make that 66 as of a few weeks ago) souls. The village has a main street. A Catholic Church. Two pubs. One very good upmarket restaurant. No fast food restaurants. One petrol station which also acts as the village's only hardware store and also one of three food stores. A post office (in which another food store is also located). A small tea shop owned by Evie, a wonderful older woman who makes scrumptious Scones, but only during the Summer months. An old Dance Hall that is closed now but used to be a true Ballroom of Romance. And yet...the village isn't isolated. It's only 10 minutes from Castletownbere (one of Ireland's largest fishing ports), 30 minutes from Glengariff (where Maureen O'Hara of The Quiet Man now resides), 50 minutes from the bustling town of Bantry, and 2.5 hours from Cork, Ireland's second capitol (or first capitol, if you believe anyone from County Cork). Eyeries is small. The coastline which you've seen is beautiful. Miles of coastal walks along the Ring of Beara eminate from this small village. An 18th Century English Coast Guard station - now in ruins - rests near. Older ruins, the site of many Irish legends, dot the landscape. From my back window I have a view of Coulagh Bay. Across the Bay, and at night, I can see the lights of the equally small village of Kilkatherine. Beyond that - the Atlantic. And jutting up around the Bay, holding it in great stoney arms, are the Kerry Mountains. It's wonderful. It's unknown. Only a few hundred tourists, mostly walkers from Continental Europe, visit every year. They come for the views and for the silence and the peace. Yet they seem to keep the location of Eyeries to themselves. Eyeries seems to be an unknown paradise. Perhaps another Bali Hai or Shangri-La. I promise not to tell anyone. At least I know if I ever stumble into Eyeries that I am pretty sure if I ask any soul where the Yank lives they will know who I mean! Although after so many years there, can anyone tell you are one of us without being told? It sounds divine, it really does. Glad you are enjoying it! Have the kids been down yet?